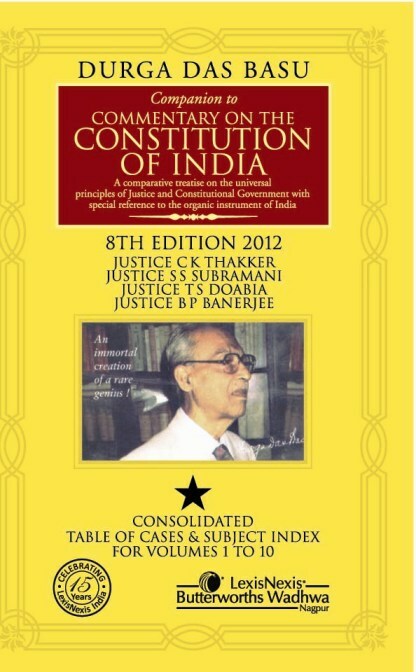 D D Basu’s Commentary on the Constitution of India is a pioneering work on the Indian Constitution. First published in 1950, the Commentary with each successive edition has remained acknowledged as the most authoritative publication on the subject. The present volume has been conceptualized to help readers navigate effortlessly through the massive amount of case law and thousands of pages of narrative and analysis in the ten volume set. This companion volume contains Article-wise presentation of cases providing a single point reference to more than 37,000 cases, both Indian and foreign, on various topics within Constitutional Law. It contains a consolidated Table of Cases and Subject Index compiled from volumes 1 to 10 of the Commentary with page references to the original work.